The Toronto Marlies paid their final visit to Binghamton on Saturday night to close out a three-in-three. 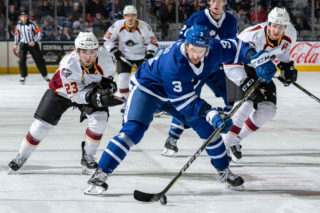 After securing a playoff spot last night, the Marlies rested a few of their regulars to give some of the newcomers an opportunity in the lineup. 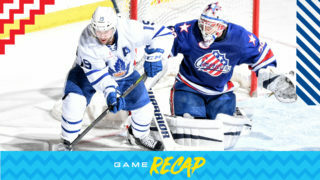 The Marlies battled back from a three-goal deficit to force overtime and pick up a point. 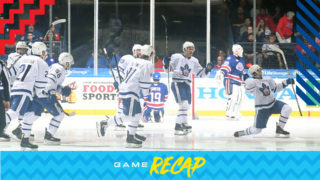 Unfortunately the Marlies were unable to complete the comeback as the Devils potted the overtime winner for a 4-3 win. John Ramage opened the scoring at 7:31 of the first period from Blake Pietila and Ludvig Larsson. The Marlies outshot the Devils 8-6 in the opening 20 minutes but couldn’t find the back of the net. Back to back penalties in the second period cost the Marlies as Nick Saracino scored two power play goals to give the Devils a 3-0 cushion. Jeremy Bracco got the Marlies on the board late in the second, backhanding in a rebound that came off the pads of Cam Johnson. 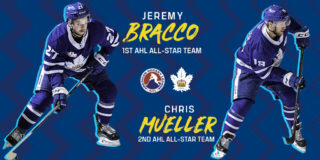 Chris Mueller and Tanner MacMaster assisted on Bracco’s 21st of the season as the Marlies were within two. Colt Conrad snapped a wrist shot past Johnson from the slot at 11:47 to bring the Marlies within one. Nicholas Baptiste and Trey Bradley assisted on the goal. With just over five minutes remaining in regulation, the Marlies found themselves on their first power play of the game. Six seconds into the power play, Jeremy Bracco sent the puck out in front and Chris Mueller redirected the pass into the back of the net to even the score 3-3. Jordan Subban had the secondary assist on Mueller’s 33rd of the season. The score remained even at 3-3 at the end of regulation. 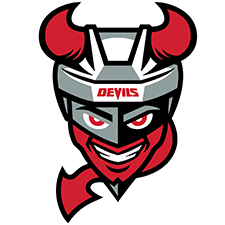 Colton White put home the overtime winner 1:54 into extra time to seal a 4-3 win for the Devils. 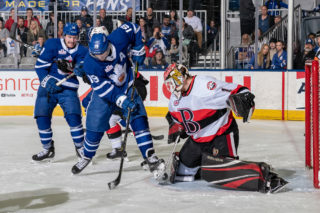 The Marlies will visit the Belleville Senators on Wednesday before returning home to Coca-Cola Coliseum to close out the regular season this weekend. Jeremy Bracco scored at 18:53 of the second period and later added the primary assist on Mueller’s third period power play goal. Bracco has recorded 28 points (7 goals, 21 assists) in his last 22 games. He is tied for the AHL lead in points (77). Colt Conrad scored at 11:47 of the third period. Conrad has two goals in four games with Toronto this season. Chris Mueller scored on the power play at 15:00 of the third period and earlier, recorded the primary assist on Bracco’s second period goal. Mueller hit a career-high for power play goals (16) in a season. Mueller has 65 points (33 goals, 32 assists) in 58 games this season. Tanner MacMaster registered the secondary assist on Bracco’s second period goal. MacMaster has 17 points in 54 games this season. Nicholas Baptiste picked up the lone assist on Conrad’s third period goal. Baptiste has five points (2 goals, 3 assists) in his last seven games. Jordan Subban registered the secondary assist on Mueller’s third period power play goal. Subban has 17 points (3 goals, 14 assists) in 46 games this season. Eamon McAdam stopped 38 of 42 shots he faced. McAdam is now 9-4-4-1 on the season with a .898 Save Percentage and a 2.87 Goals Against Average. This is McAdam’s first game with Toronto since January 11. This was the first AHL game for forwards Trey Bradley, Erik Brown, defenceman Alex Basso and goaltender Zachary Bouthillier who backed up McAdam. Toronto is 23-10-5-2 since January 4 and have outscored their opponents 126-111, facing 17 different teams. In 30 of 40 games, Toronto has earned a point (53). Toronto was 2-for-4 for on the penalty kill and was 1-for-2 on the power play. Toronto has not given up more than one goal on the penalty kill in a game since January 25. Utica had a 42-23 edge in shots in all situations. Chris Mueller led the Marlies with three shots on goal. The Marlies are 26-14-8-3 against North Division opponents and finish the season 3-2-1-0 against the Devils. The Marlies are 4-14-4-2 when trailing after the first period and 3-17-3-1 when trailing after the second period. Toronto is 18-13-4-2 when outshot by their opponent. The Marlies 13-6-1-0 in Saturday games and are 1-1-1-0 in April. Nicholas Baptiste has assists (2) in consecutive games. Jordan Subban has assists (2) in consecutive games. I thought the new guys here that we were trying to give an opportunity to showed well, they worked hard, they moved their feet. For a lot of them, it’s not only their first game, it’s their first day really with our team. They haven’t had practices or anything with our group. It was good to see from that standpoint. Obviously, it’s a difficult game to play for our regular guys. For a lot of them, it their third consecutive in three days here in three different cities and half of their teammates are back home in Toronto. So, it’s a tough game for those guys to get through but I guess I like the fact that we stuck with it. We tried to keep it pretty loose here today and I think that paid off in the third period when our guys just found their way back. Clearly the way we set this game up here today, we made the decision that resting our players was more important than anything that was going to happen in the game. In terms of us getting a point, that’s certainly a bonus that we got a chance to look at some guys and we got to see a lot. Some of the guys have been with us for a while that haven’t been able to play as many minutes so we got that going today. So those were some positives, just the biggest thing for a playoff team to be playing three games in three days in April is a bit of a travesty. We were able to give a lot of our guys the day here and give them some extra rest which we think is the most important thing right now. The Toronto Marlies close out their three-in-three tonight with a stop in Binghamton to take on the Devils. This is the sixth and final meeting between these North Division rivals and the Marlies have a 3-2 lead in the season series. 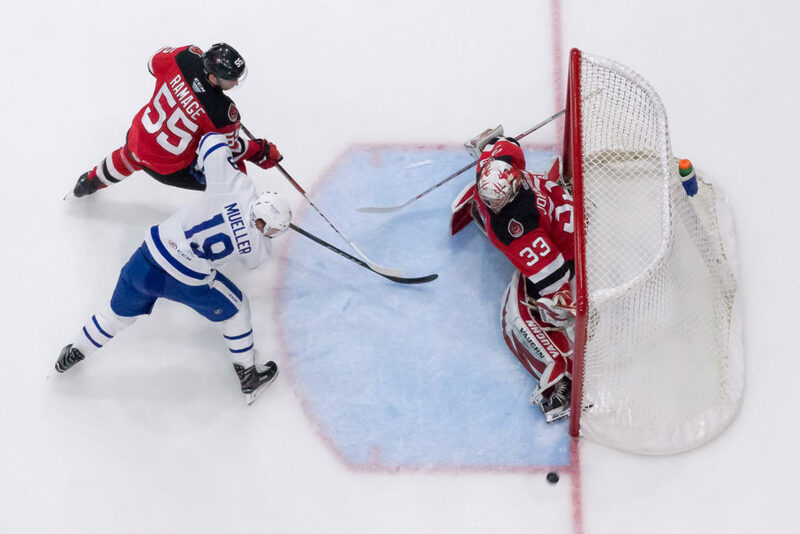 In their most recent meeting back on January 4th, the Marlies topped the Devils 5-1 in Binghamton which was their most convincing win against the Devils this season. 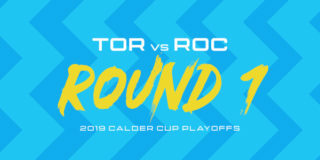 After a win last night in Utica, the Marlies secured their spot in the 2019 Calder Cup playoffs. They went 6-for-6 on the penalty kill against Utica have the top power play in the division (22.3%). The Marlies have won six of their past 10 games and have a 23-10-4-2 record since January 4, outscoring their opponents 123-107, facing 17 different teams. In 29 of 39 games, Toronto has earned a point (52). The Marlies are 26-14-7-3 against North Division opponents. The Devils are currently in eighth place in the North Division and 16th in the Eastern Conference. They’ll be looking to bounce back from to straight losses and get back in the win column tonight. Puck drops at 7:05PM on AHLTV.